Draw together in a search for the truth… now nothing will keep them apart. Lady Amelia Atherton, the daughter of the Duke of Ely, was the very jewel of the London Season, while the Royal Navy Commander Samuel Beresford is the brash, sometimes rude, younger son, of the Earl of Blackburn. But when Amelia’s father, The Duke of Ely, dies under mysterious circumstances, and Samuel’s older brother is nearly poisoned within a mere day of one another, both Lady Amelia and Commander Beresford find themselves locked in a desperate search for the culprit. Everything Lady Amelia once took for granted has been shattered, and with the Dukedom in the hands of her odious Uncle Declan, the unlikely pair rush back to London, only to find that their clandestine engagement is far more dangerous than it first appeared. That is if either party still wishes to call off the engagement? Neither could imagine falling in love … now it seems they cannot imagine loving anyone else. 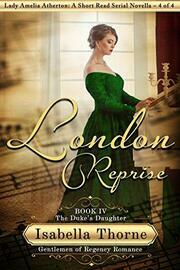 SIGN UP for her newsletter to be notified of the debut of Isabella Thorne’s next book.